You can run the entire test project or project suite, or individual automated tests. This topic explains how you can run automated tests from the TestComplete IDE. For other ways to run automated tests, see Running Tests. If a test runs the application, make sure that the application is not already running. If a test works with an already running application, make sure the application is in the right state for the test. If a test creates files, make sure these files do not already exist. If needed, add the appropriate commands at the beginning of the test to create proper initial conditions. 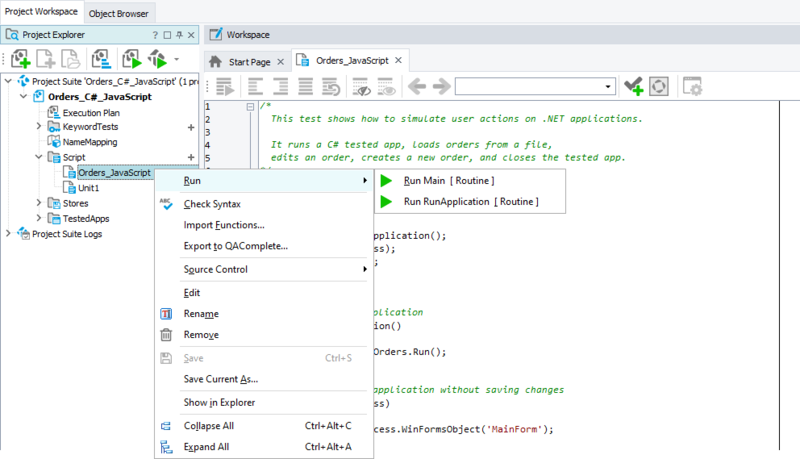 Configure the test run order on the Test Items page of the project editor or project suite editor. Select Run Project or Run Project Suite from the Test menu. 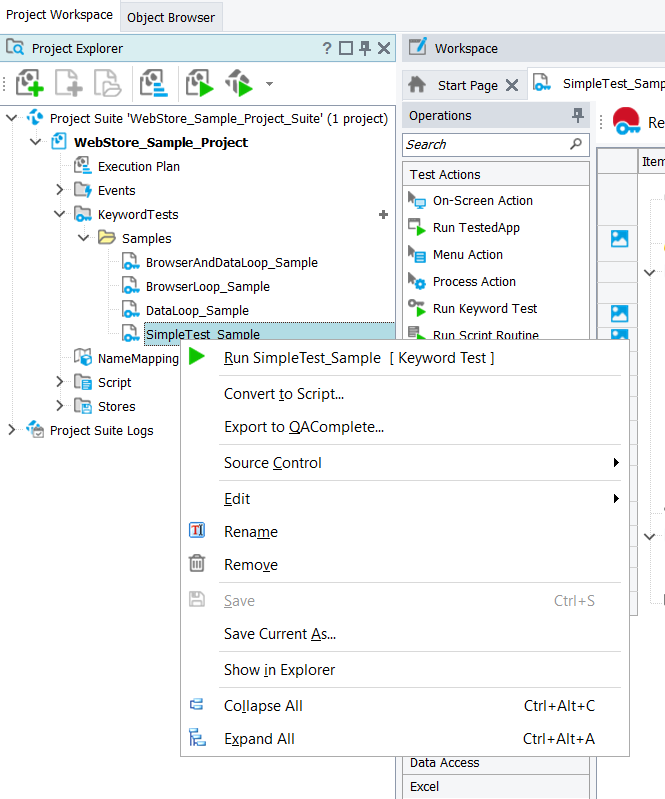 Select Run > Run Project or Run > Run Project Suite from the Test Engine toolbar. If a project does not have project items, the test engine is unable to run it and shows the The project_name project cannot be run because there are no test items in it message. You can add test items to the project or select a test to run. If the project suite does not contain projects or if all of the projects are excluded from the suite run, the test engine is unable to run the project suite and shows the The project suite cannot be run because there are no selected projects to be run message. Right-click the needed script unit in the Project Explorer and select Run from the context menu. Open the test in the Keyword Test editor and then click Run Test on the editor’s toolbar. Right-click the needed script unit in the Project Explorer and select Run | Run RoutineName from the context menu. In the Code Editor, place an insertion point inside the routine code and then click Run This Routine on the Code Editor’s toolbar. Note: This works only for script routines that have no parameters. Routines with parameters can be called only from other tests, because you need to specify parameter values. Right-click the item in the Project Explorer and select Run from the context menu. Select Run > Repeat Last Run on the Test Engine toolbar. Click the button on the TestComplete indicator. Press Shift+F10 (the shortcut can be changed in the Global Shortcuts dialog). Click Pause on the Debug toolbar. Note: You cannot pause network suites (distributed tests) and low-level procedures. Debug the test: step through it, view variable values and so on. View the current test log (if the Show Log on pause option is enabled). Press Shift+F3 (the shortcut can be changed in the Global Shortcuts dialog). Click Run on the Test Engine toolbar. (For keyword tests only) Right-click within the Keyword Test editor and choose Continue from the context menu. Press Shift+F2 (the shortcut can be changed in the in the Global Shortcuts dialog). Click Stop on the Test Engine toolbar. TestComplete lets you stop tests on timeout and on errors. For more information, see Controlling Test Execution Flow. in scripts - using the Runner.Stop or Runner.Halt method (the difference is that Stop does not log an error). Ignore any errors and continue the test run. Stop the current test and proceed with the next test (applicable, for example, when running a project). Stop the test run when an error limit is reached. Stop the test run only when a specific error occurs. To learn how to do this, see Controlling Test Execution Flow.